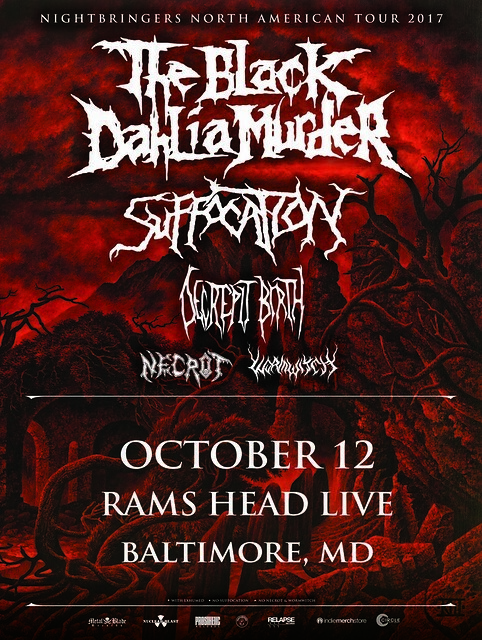 On Thursday, October 12th, The Black Dahlia Murder headlines a crazy death metal line up at Rams Head Live! 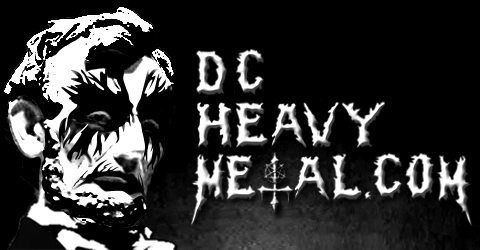 We’re psyched to be giving away a free pair of tickets to the death metal tour of the year to one of you lucky DCHM readers. To enter just leave a comment on this post telling me what your all time favorite death metal band is. Then on Monday, October 9th at 5pm EST the contest will close and a winner will be chosen at random (using Random.org) from all valid entries. Be sure to use a valid email you check regularly so I can contact you if you win. Don’t worry, I won’t add you to any spam lists or sell your info or anything sleazy like that. If I haven’t heard back from the winner in 24 hours another winner will be chosen at random. If you can’t wait to see if you win or the contest is already over when you read this, then you can get tickets from AXS for $20 here. The Black Dahlia Murder is releasing their new album, Nightbringers, this week and this will be their only area appearance on this tour to support it. 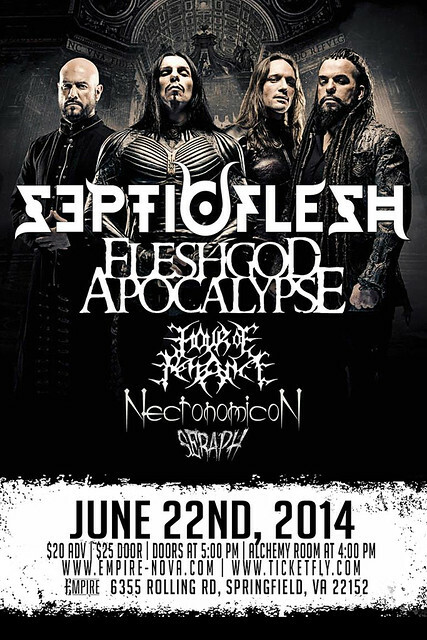 Also on the bill is the legendary Suffocation! One of the pioneers of brutal death metal, Suffocation gets some of the wildest mosh pits going with just the twitch of the wrist. Tech death band Decrepit Birth released their first album in seven years this summer. 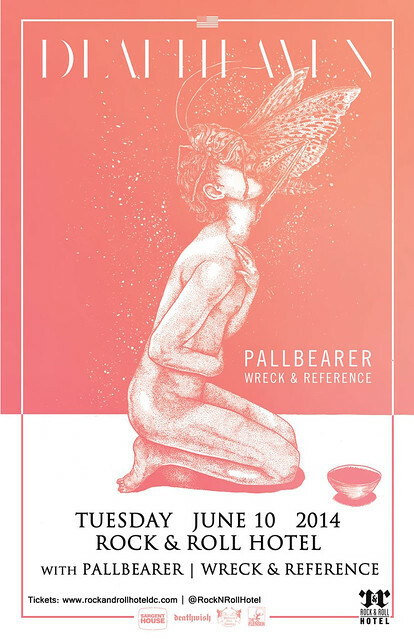 They put on a killer set at Maryland Deathest this year, do not miss their return to Baltimore! Necrot is a new death metal band from Oakland featuring members of Vastum and Saviours. 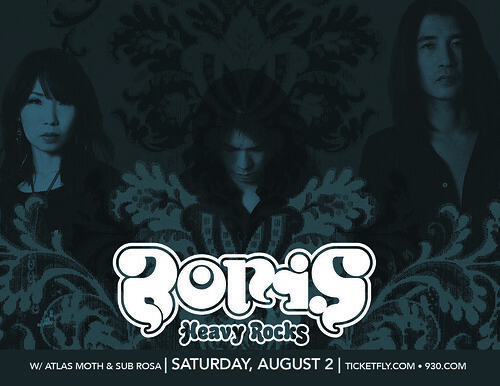 Opening band Wormwitch is also new. The crusty black metal band’s debut album just dropped in May. Now check out these videos of the bands below and be sure to leave a comment telling me what your favorite death metal band of all time is! Halloween might have come and gone but you can extend the costumed fun next week when Gwar plays at the 9:30 Club on Sunday, November 9th (that's this Monday!). 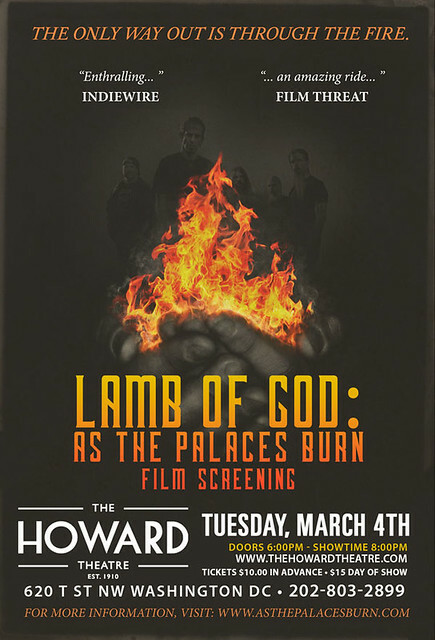 I’ve been commanded by my scumdog slavemasters to bring more lambs to the slaughter which means one of you (un)lucky DCHM readers will win a pair of tickets to attend this very massacre concert. To enter just leave a comment on this post letting me know what the best costume you saw this Halloween was. At 5pm EST this Friday, November 6th, a winner will be chosen at random (using Random.org) from all valid entries to win the tickets. Be sure to use a valid email you check regularly so I can contact you if you win. Don’t worry, I won’t add you to any spam lists or sell your info or anything sleazy like that. If I haven’t heard back from the winner in 24 hours another winner will be chosen at random. If you can’t wait to see if you win or the contest is already over when you read this, then you can get tickets from Ticket Fly for $25 here. If you’ve never seen Gwar live before then get ready for a truly religious experience! Our alien masters are known for putting on the goriest live show in the universe and you’ll be covered in blood, bile and worse by the time it’s over, a truly epic baptism by mosh pit. 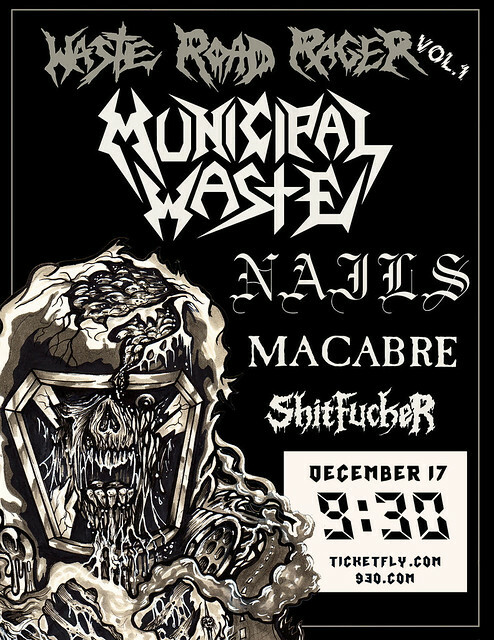 But before Gwar even dominates the 9:30 Club stage there will be sets by other bands as well. 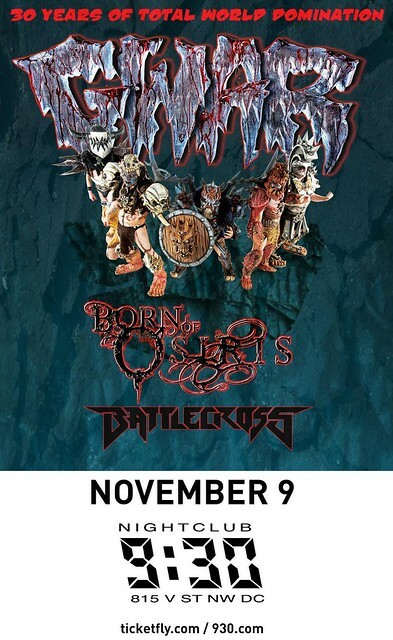 Born Of Osiris, a Chicago based djent band, will be direct support and starting off the festivities is Battlecross, a melodic death/thrash band that is incredible live. Still not sure if you should go? Then check out these awesome music videos by the bands playing the show as you think up your entry!